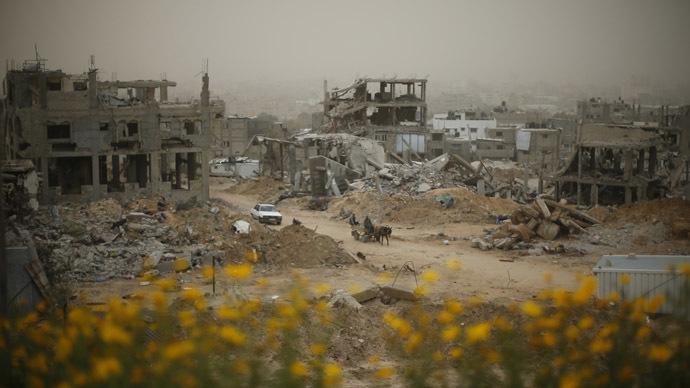 An investigation carried out by AP has stated that 508 of 844 victims in air strikes on residential buildings during Israel’s Operation Protective Edge that unfolded previous summer in Gaza were women, children and elderly people. The agency studied 247 attacks that targeted residential buildings only – out of about 5,000 strikes conducted by the Israeli forces. Under the rules of war, civilian homes cannot be used as targets for air strikes. The probe concluded that about 10 percent, or 96, of those killed in the strikes were confirmed or suspected militants. A further 240 dead were males between 16 and 59 years old, whose names weren’t linked to any armed groups. Finally, 508 of the 844 victims were women - whom Hamas says they do not recruit – children and elderly people. In particular, children under 16 constituted about 30 per cent of the total deaths: 280 killed, among these 19 babies and 108 kids between 1 and 5 years old. In 83 attacks, three or more members of one family were killed. AP said that the actual death toll, including actual militants, could be higher as armed groups have not released detailed casualty lists. According to Israel’s figures about 890 militants were killed in Gaza, among them 590 from Hamas, 200 from Islamic Jihad and 100 from other armed factions. A death toll in airstrikes on homes has not been provided. Israel has stated it hit only legitimate targets, saying that militants used residential buildings to store weapons and to hide their command centers. "Our position is very clear. Israel did not commit war crimes," Foreign Ministry spokesman Emmanuel Nahshon said. The Israeli authorities also stressed that they warned civilians of the coming strike when it was possible, with through phone calls or "knocks on the roof" with non-explosive missiles. Palestinians, however, said that Israeli air force often hit a target without paying any attention to civilian population. "Either they have the worst army in the world that constantly misses targets and hits civilians, or they are deliberately killing civilians," Hanan Ashrawi, a Palestinian spokeswoman, said. The majority of the dead are civilians, so "you cannot call them collateral damage," she added. AP’s investigation have been initially led by two human rights groups: Al Mezan, in Gaza, and the Israeli rights group, B'Tselem. The latter in particular contradicted the Israeli claim that targeting homes is lawful. "This argument ignores the spirit and purpose of international humanitarian law, which primarily aims at reducing as much as possible the harm caused to the civilian population," the group wrote in a report on house strikes in January. This policy is "unlawful through and through," it added. Starting from November, three AP reporters visited most of the attack sites, interviewed survivors, found hundreds of death certificates. These documents are officially considered by Israel to be proof of mortality, and also had birth dates, so the group could be split by age groups. Preliminary UN figures have demonstrated that the total death toll from the 50-day conflict – the third and most tense between Israel and Hamas since 2008 – was 2,205 people. 66 percent of the toll were Palestinian civilians – 1,483 people. On the part of Israel, 66 soldiers and 6 civilians lost their lives. The deadliest attack recorded in Gaza happened at 7.30 am on July 29, which is a Muslim holiday. 33 people from four families were killed, and also a young girl from a home nearby, as an apartment building was targeted in Khan Younis. The war started in July, following the killing of three Israeli teens by Hamas in the West Bank, as well as Israeli arrests of Hamas supporters. Palestinian President Mahmoud Abbas has asked the International Criminal Court to look into the conflict, which could see both Israel and Hamas prosecuted. It comes after Palestine joined the International Criminal Court in January.